“The marathon trial of The Nation magazine editor Bheki Makhubu and human rights lawyer Thulani Maseko ended yesterday, nearly 115 days after their first arrest,” reported the Times of Swaziland. 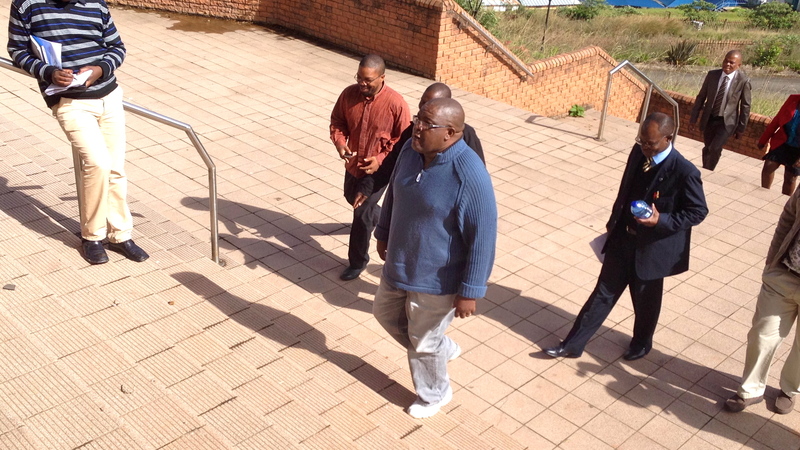 Makhubu and Maseko have been in jail for 106 days as the trial played out. Both men were charged with criminal contempt of court in March after writing opinion pieces in which they criticised the actions of the nation’s judiciary, in particular Swaziland chief justice Michael Ramodibedi, who recently stepped down from a senior judicial position in his home country Lesotho. In their articles Makhubu and Maseko accused the chief justice of acting unlawfully during the arrest and detention of Swaziland’s chief government vehicle inspector. The Crown argued that the opinion pieces used language that was unfair and disrespectful to the chief justice and the judiciary. Lawyers for the detained duo said their comments were fair, true and in the public interest. “Advocate Lucas Maziya, who is part of the defence team, said in his submission, it was accurate to say the CJ massaged the law,” reports the Times of Swaziland. The Crown’s legal team, led by the DPP, has been pushing hard for a conviction of the two writers. “The Diretor of Public Prosecutions Nkosinathi Maseko prays the Judge Mpendulo Simelane convicts” Makhubu and Maseko, reports the Swazi Observer. The presiding judge (Simelane) also features in the opinion articles at the centre of the saga. Defence lawyers at the beginning of proceedings applied for Simelane to recuse himself from the trial but to no avail. Lawyers for the two detained men have consistently argued that they were “exercising their right to freedom of expression as enshrined in the Constituion”, reports the Times of Swaziland. The case has generated a lot of interest in Swaziland and has been reported on by the two daily newspapers, however little has been reported on radio and television which are controlled by the State. International media has also covered the trial. The Associated Press (AP) and the Washington Post published reports after Maseko delivered a statement from the dock. “Maseko delivered a blistering attack on the Swazi judiciary and political system in a trial that has focused fresh attention on human rights issues in a country who’s authoritarian system gets little scrutiny in international forums because of the country’s small size and strategic insignificance,” said the article. The South African press has also covered the story. “Swaziland and Zimbabwe prisons respectively hold two editors because they either expressed opinions about how their country was governed or allowed for such views to be expressed in their papers,” wrote executive editor of Pretoria News Fikile-Ntsikelelo Moyo in an opinion piece in The Star newspaper. “This is no different to the times when journalists like Zwelakhe Sisulu, Aggrey Klaaste, Percy Qoboza and many others routinely spent time in apartheid jails for daring to use their journalism platforms to speak truth to power,” said Moyo. The Times of Swaziland reported that “Judge Simelane said he would take his time to consider all submissions made by both the Crown as well as the defence counsel. The matter was postponed ‘sine die’, meaning until further notice”. The judge said he would inform Makhubu and Maseko when a ruling was ready. Makhubu and Maseko, who Amnesty International has called “prisoners of conscience”, will remain in jail as judge Simelane considers his ruling. Tags: bheki makhubu, Contempt of court, free speech, Michael Ramodibedi, swaziland, Thulani Maseko. Bookmark the permalink.